Forget about the “27 Club” talk. Amy Winehouse’s death is a mournful echo of Michael Jackson’s demise – and the post-mortem exploitation has only just begun. 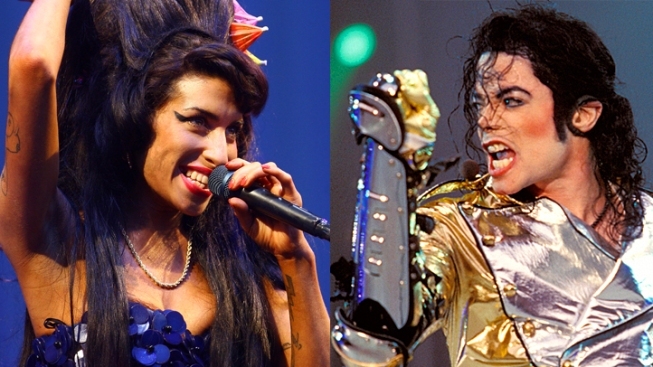 Amy Winehouse had more in common with Michael Jackson than just talent. Amy Winehouse’s sad death has spurred stories and morbid chatter (including a Twitter trending topic hash-tagged “#27Club”) noting she’s the latest star-crossed music star to succumb to celebrity excesses and personal demons at age 27, joining a gone-too-soon pantheon that includes Jimi Hendrix, Janis Joplin, Jim Morrison and Kurt Cobain. The sad coincidence of that tragic number aside, perhaps there’s a more apt and current comparison to be made between Winehouse and a performer who somehow made it to 50: Michael Jackson. Sure, both were trying to mount comebacks that were never to be. But the biggest similarity is that, to different degrees, we watched their respective declines play out in multiple media over a period of years. Their deaths elicit both a haunting sensation of inevitability – and a frustrating feeling of helplessness amid being unable to stop these slow-motion train wrecks. And now the same celebrity-obsessed Internet- and TV-driven pop culture that gave us an open window into the stars’ immolation is helping fuel their exploitation in death. Let’s be clear: Winehouse’s short-lived career didn’t approach Jackson’s four-decade entertainment reign in scope and impact, and his music likely will resonate far longer and louder. Winehouse, who offered sultry, contemporary twists on the merger of pop and soul, owes much to Jackson who, as a child, helped propel the genre, and as an adult reinvented it a couple times to become the most influential performer of his generation. She also followed him in far less healthy ways. Both exhibited erratic, often self-destructive behavior that provided plenty of fodder for a 24-hour tabloid culture – one that’s become even more instantaneous with the advent of the Internet, which was in its infancy when Cobain, the last member of the 27 Club, killed himself in 1994. Both Jackson and Winehouse died in the summer, a time when the news cycle is traditionally slower than usual. The media circus that sprouted around Jackson’s June 25, 2009, death, has yet to leave town and probably never will. We’re already seeing sordid accounts of Winehouse’s last days, overshadowing news of far wider impact, such as the horrible massacre in Olso. The judge ruled Monday against showing the unseen footage. So we’re left – at least for now – with images of Jackson, who, while frail looking, appears to be in control of his art in the movie. Sadly, the lasting images many will have of Winehouse are from the YouTube video of her disastrous performance in Belgrade last month, in which the apparently inebriated singer got booed off the stage. 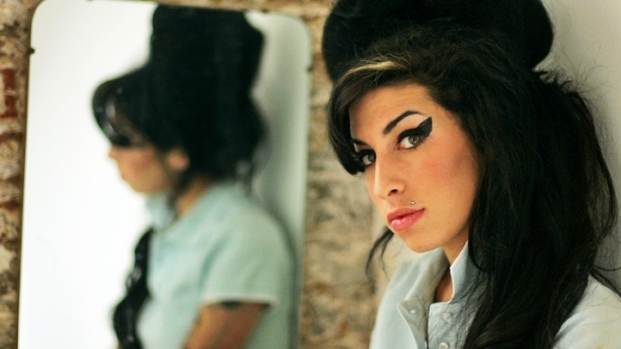 Winehouse’s greatest performance – her 2007 album, “Back to Black” – shot to No. 1 on iTunes over the weekend, echoing the spurt in Jackson post-mortem sales two years ago. There will be more music to come, no doubt – but not necessarily of the quality the artists would have liked. The first of an expected 10 albums featuring unreleased tracks by Jackson, a notorious perfectionist, proved a mixed bag. There already are reports that Winehouse’s long-delayed, apparently unfinished third album will be released, presumably to capitalize off the publicity from her demise. One of the shames of all this is that Jackson and Winehouse – like, Hendrix, Joplin, Morrison, Cobain, Elvis Presley and others before them – could become defined for future generations by way they died instead of by the musical gifts they offered in life. That’s a club with too many members – of any age.